Did You Know You Could Play Underwater Hockey & Rugby In Pune? Finkick Adventures is a scuba diving centre that offers in-land scuba diving, PADI certification, open water diving, underwater games, and are also the creators of the Pune and Mumbai versions of the ‘Underwater Festival’. Finkick was co-founded by Ankit Saboo and Kshitij Mittal, who wanted to share their passion for SCUBA with a larger audience – but in an accessible, authentic way. 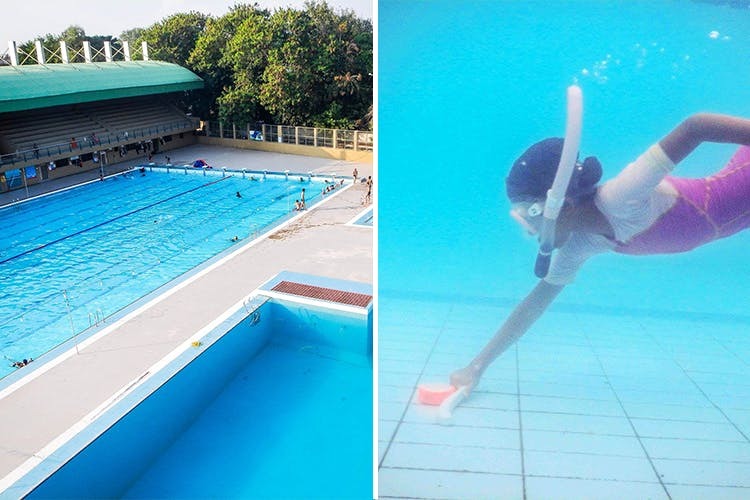 Though Pune is not near an ocean, Finkick hosts scuba diving training and activities in-land via the Divisional Sports Complex Swimming Pool facility in Yerawada. Here, you can get PADI certified – a life-time validity course, which is internationally recognised and certifies you to ‘dive anywhere in the world up to 18 metres’; as well as begin your PADI Open Water Diver Course (OWDC). What really piqued our interest though, were their underwater games – namely underwater rugby, underwater cycling, an underwater playground, and underwater hockey – also known as ‘Octopush’. Octopush was ‘ first developed as a winter activity for scuba divers to keep fit’ in 1954, and is a non-contact sport with 6-aside teams having 4 substitutes. The objective is to push a ‘puck’ at the bottom of the pool, into your opposing team’s net to score a goal (pretty similar to above-water hockey). Finkick recommends you try a few sessions as an introduction to the game before you play an official one. Check out more on Octopush here and contact them directly to find out when their next game session will be. Before signing up for a PADI course, you can also enrol for their 2-hour “Try A Dive” session, to get an idea of how comfortable you are in full gear, underwater. Finkick also plans special dive trips to different sites across the world; from Havelock in the Andamans, to Hawai’i in the United States, Indonesia, Mexico, Malaysia, Sri Lanka, and Thailand. You can view the various packages via their website, here.